Registrations open till 9th April 6pm or till tickets last ! Very few seats. Register NOW ! Registration with successful payment mandatory for entry. पं शौनक अभिषेकींच्या हरहुन्नरी गायकीच्या सर्व अंगांचा आस्वाद घेता यावा म्हणून 'महाराष्ट्र मंडळ सिंगापूर - स्वरगंध' आणखी एका खास कार्यक्रमाचे आयोजन करीत आहे. मर्यादित जागा उपलब्ध असल्यामुळे प्रवेशासाठी नोंदणी केलेली असणे आवश्यक आहे. कृपया आपली तिकिटे MMS च्या वेबसाईटवर पैसे भरुन ९ एप्रिल ६ वाजेपर्यंत नोंदवा. 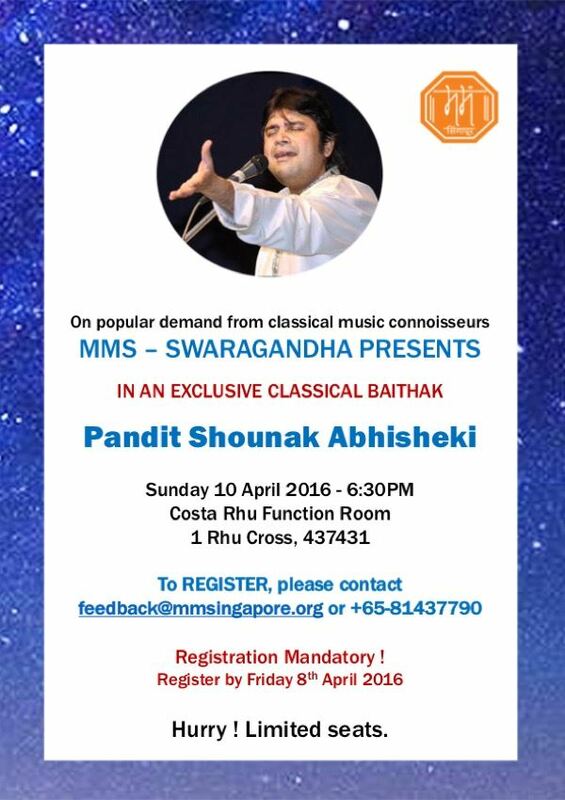 To enjoy the various facets of the singing of the versatile Pt Shounak Abhisheki, Maharashtra Mandal (Singapore) - Swaragandha is happy to present one more concert in the evening of Gudhi Padwa. This will be an exclusive baithak-style concert for classical music connoisseurs. Please find the details below. Very few seats. Register NOW !